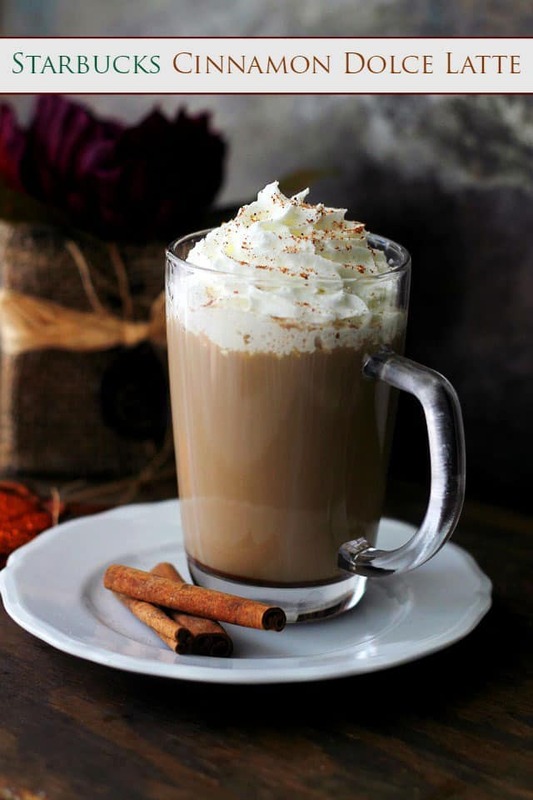 Starbucks Cinnamon Dolce Latte – An exact replica of Starbucks’ deliciously sweet, warm and comforting Cinnamon Dolce Latte. Hi friends!! Happiest of Fridays! What’s on the agenda for tonight? Dinner? Movies? Getting plastered?? Apparently “pissed” in Aussie-terms means plastered. Or drunk. Wasted! Hammered? Trashed!? Got more? Obviously, this has nothing to do with Cinnamon Dolce Latte since alcohol is out of the recipe equation, buuuut if you’re looking to get your Friday freak-ON with coffee AND booze, take a sip of this Authentic Irish Coffee – that is some goooood stuff! Starbucks is like a whole country away from my house. It takes a bit over 20 minutes to get to it, mostly because of the trillion stop-lights that you have to get past. Which, by the way, I LOVE it when I catch them all on GREEN!! I always feel SO accomplished when I just buzz right through them all! 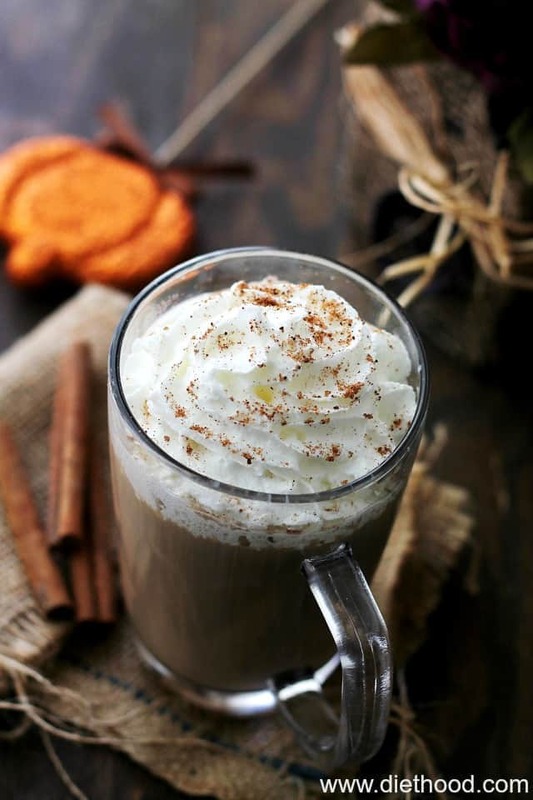 So to avoid all the red lights, and to get my Starbucks-fix, many a times I will just go into mah kitchen and prepare mahself a good ole Cinnamon Dolce Latte! OR a Pumpkin Spice Latte. Don’t you just want to go ahead and cradle that mug? Like right now!? If you hop into your kitchen right this second, it will be in your hands in about 4.3 minutes. 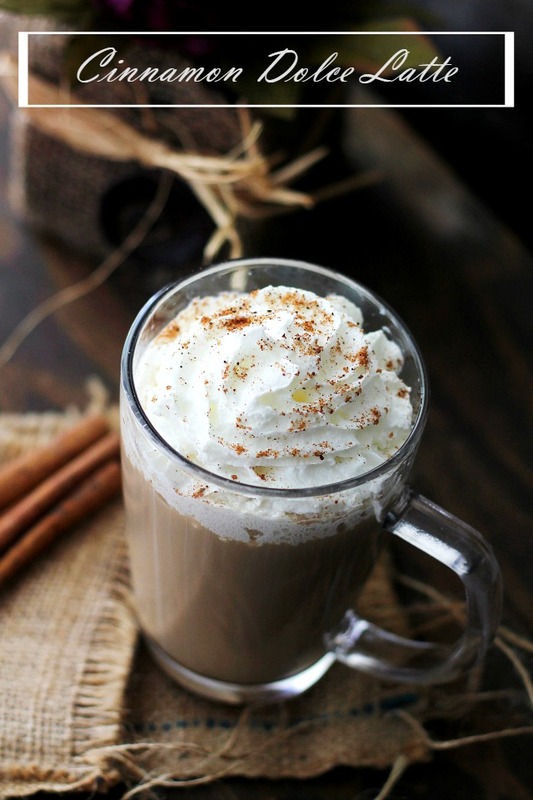 This easy coffee recipe is an exact replica of Starbucks' sweet, warm & comforting Cinnamon Dolce Latte! 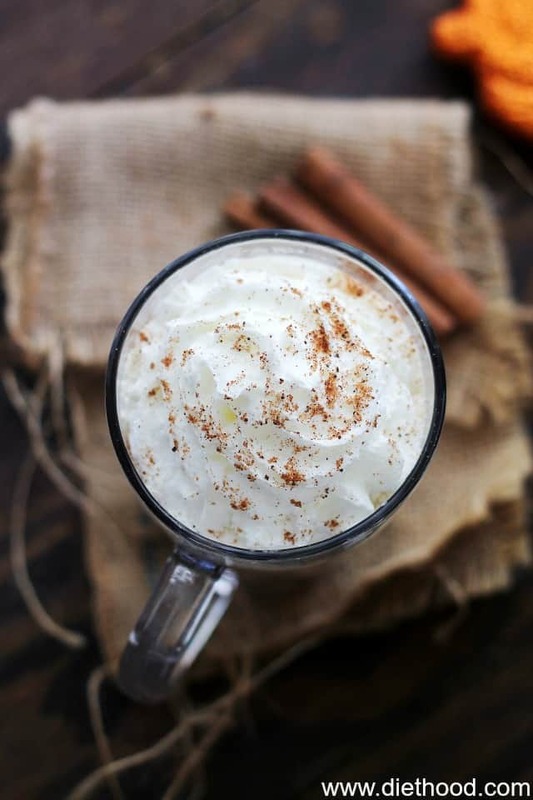 Perfect for the holidays & chilly weather sipping. Stir the espresso powder into the hot water and set aside. In a glass measuring cup combine milk, cinnamon, brown sugar, vanilla and nutmeg; stir until thoroughly combined. Place in Microwave and cook for 1 minute and 30 seconds, or until the milk starts to froth up. Place in Microwave for an additional 30 seconds, or until the milks starts to froth up again. Remove and, while stirring the espresso, slowly pour the milk mixture into the coffee. I rarely go to Starbucks for lattes but this one, since I can just make at home without spending too much, and because I read cinnamon on it, I would most probably include it in my weekend to-do list. I bake during weekends, but I can slip this simple recipe while waiting for my goods to bake. Thank you so much for this recipe, Katerina! alot of other countries use the same kinda slang it’s really not that hard to work out. Thank you for this! I used vanilla almond milk and the microwave time was perfect. I also made espresso in my French press (4 TBS of coffee to 1 cup boiling water). Everything was perfect!!! Just made this. You REALLY have to watch the microwave. 1 minute and 30 seconds is too long for the milk mixture and it boiled over. I’d say 1 minute and maybe 5-10 seconds is good. So, I had to add a smidge more milk like 1-2 tablespoons. After stirring and putting it in the microwave again for 30 seconds…that was too long as well and again it boiled over and I did watch it this time but its pretty fast at boiling over…just wasn’t quick enough. All said and done I tried it and the flavor is ok but its not as sweet as Starbucks is. So, I might add a full tablespoon of brown sugar next time. Also, it might not be a bad idea to add your spices after you nuke the milk the first time because cold milk and spices are very difficult to incorporate. 🙂 I make a lot of lattes at home so I know what works and I’ll try this again tomorrow morning with the extra brown sugar and see how that goes! 🙂 Otherwise I did like it just need a little more sweetness. I love me some good cinnamon dolce latte. I made one this morning but my froth disintegrated right before my eyes! Flavor was good but I miss my froth. Try this! I bet if you put everything in the jar and did it it just may work! I always get excited when I see Starbucks copycat recipes! We get pumpkin spice lattes where I live (since last year!!) but that’s about it 🙁 I’ve been wanting to try the Cinnamon Dolce one forever! It looks so good! Very comforting. My weekends are so boring. Oh well! Nice that you got to go to Australia – not many people get that opportunity. My inner sugar monster is mad right now because it doesn’t have one of these. It looks amazing! I’m making a Starbucks run in the morning so I might have to give this a try. Thanks for sharing & happy Friday! This would not last 10 seconds! Want! Pinned! I could down this in less than 30 seconds, and need a refill! Gorgeous & pinned! Starbucks by me is on every.corner. here in Chicago,can’t believe that they would spread them out otherwise! I love me some homemade coffee drinks-must try this out! I love lattes. Oh I cannot wait for tonight. Tonight I’m going to enjoy a tasty pumpkin ale. Mmmm. 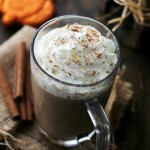 So one of my favorite SBux drinks is the Cinnamon Dolce Latte, although, I don’t order it enough. But who needs to order when you can make it at home. Great recipe, Katerina! Sign me up for three of these beauties! You know me and my love for caramel so you know I’d be all over this one. I could slurp this down in a jiffy. Like I really want this now.